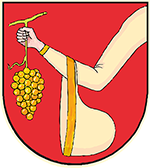 No vineyard of the world produces so elegant, juicy and playful wines as the Mosel. Wines, which are not only marvelous to drinking and enjoying, but also excellent for meal companions. Internationally “we” belong to the largest ones. A “Mosel” belongs exactly the same into the vault, like a “Bordeaux” or “Sautern”. For over 2000 years we find the cultivation of wine in the Moseltal. The Försterlay is the heart of the small winegrower’s town. It lies on the other side of the Mosel. The small and steeply location is about 10.000 squermesters tall. The vines on the percussion slope are on central to deep clay/tone slate residual soil. Closely stand the vines stand up to an upward gradient of 70%. Only small management ways passing though the lines. These were put on only in the middle of the 90’s in the course of the consolidation of farmland and cause an enormous facilitation of work for the winegrowers. The location has an SW-exposition and is emblazoned proudly, as in a Amphitheater, to the Mosel. Predominantly Riesling is developed here after old tradition. . A further vineyard situation of Lösnich is the “Lösnicher Burgberg”. Its located above the town. There on the deep washing ground carousing wines are cultivated predominantly, which are to be worked on economically more simply.